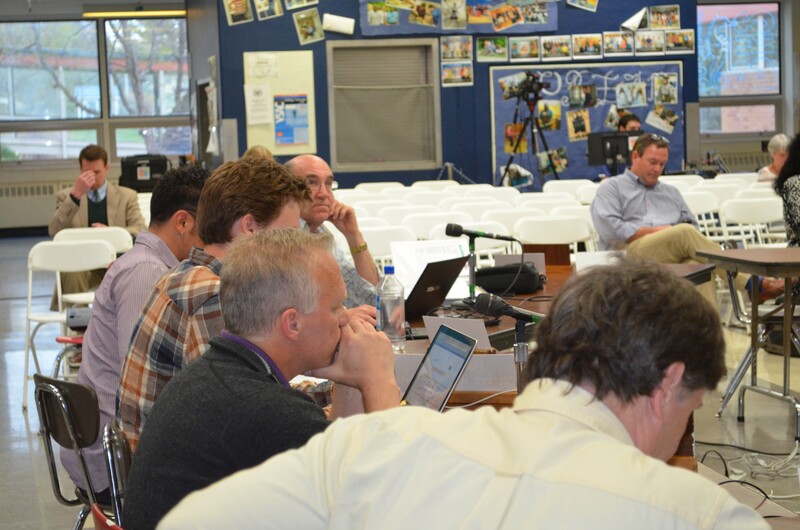 From left, board members Keith Pillsbury, Brian Cina, Henry Prine, Alan Matson and Charlie Giannoni at a meeting on Tuesday. With one phone call from the state to its lawyer, the Burlington School Board got yet another dose of bad news at a finance committee meeting on Thursday night. Members already knew that a $1.5 million pot of revenue — which the district is banking on for next year’s budget — might be in jeopardy because of a conflict between state law and the city charter. Up until a few days ago, it was just the city and the school district agreeing to get to the bottom of the legal quandary at some point down the road. Now, the state has upped the ante. The school district’s lawyer, Joe McNeil, informed the board that on Wednesday, the Agency of Education (AOE) gave the district an ultimatum: Voluntarily give up that revenue, starting in Fiscal Year 2016, or risk having to pay back the state for the previous years it had received it. The revenues in question are the “payment in lieu of taxes (PILOT)” that Burlington’s publicly- owned utilities give to the city instead of paying property taxes. In accordance with city charter, the city then divvies up that revenue, 50-50, with the school district. Questions about the legality of this arrangement arose after Vermont overhauled its education finance system in 1997 and 2003, during which state law was changed to prohibit subsidizing schools with city revenue and vice versa. For the past several years, city and state officials have suggested that the PILOT fund arrangement violates this law, but no action has been taken. Recently, Burlington’s chief administrative officer, Bob Rusten, raised the question again, and the city made the school board sign an agreement saying they’d return the money should they turn out to not be legally entitled to it. Apparently, the AOE is no longer in the mood to dillydally. It gave the district a May 29 deadline for making its decision, and if the school board fails to meet it, the secretary of education will use her authority to freeze the payments, according to McNeil. That would strip the district of $1.5 million that's already been written into the Fiscal Year 2015 budget. Should the district voluntary sacrifice the funds, board member Alan Matson wanted to know whether the state or the city would scoop them up. McNeil explained that the city would need to amend its charter before it could recoup them; in the meantime they’d be sent into the state coffers. This question comes as the city administration is poised to become closely involved in school finances. The unusual move, which has made some uncomfortable, is being cast as a “collaboration” rather than a coup. But in light of this three-way squabble over cash, at least one board member said he was growing more skeptical of the positive spin put on the arrangement. “It’s not a partnership on this issue so I am very skeptical about this whole thing,” Keith Pillsbury, who announced early that he would resign his post in June, after more than 20 years on the board. Finance chair, Miriam Stoll took a more conciliatory tack, suggesting that the committee agree to relinquish the PILOT revenue while also attempting to convince the city to help the district out financially in a different and more indirect manner. The finance committee voted unanimously to recommend that approach to the full board, which meets Monday. This dispute feeds into another of the board’s headaches — what Stoll described as the “cash flow issue” on Thursday evening. She was referring to the possibility that the school district will run out of money in the upcoming weeks. At this point, it’s all but certain the district will close out FY 2014 (which ends June 30) in the red by about $2.6 million. Matson suggested the board could prevent the bank accounts from actually hitting rock bottom by managing its cash flows in a certain way. Finance director, David Larcombe (who on Wednesday announced his resignation effective June 30) wasn’t at the meeting, and the committee concluded it couldn't confirm Matson's strategy. If the district is going to run out of money, it can either borrow from the city — although, unlike in past years, it needs formal permission and will have to pay a predefined interest rate — or it can go to a bank for a loan. Checks could bounce if the board doesn't make a decision soon, and Rusten has been prodding the board to figure out which borrowing option it will take. But in a memo to the finance committee, Larcombe pinned some of this uncertainty on the city itself. Remember those PILOT funds? The city hasn't sent over the school district's portion yet — possibly because it's waiting to see how the board responds to the AOE's ultimatum — and that, according to Larcombe, creates a hole in the bank account. Last year, the school district also had a deficit of well more than $1 million, but "we were able to maintain a positive cash balance total... longer into the months because over $300,000 of Pilot funds were deposited," Larcombe wrote. "This year we do not have the additional $1 million in cash that was received by this time last year."